Things rarely go to plan for Ethan and the IMF in Fallout. Although we discussed the transformation of Mission: Impossible from its relatively grounded roots to full-blown action franchise when we reviewed the 4K releases of earlier films, Fallout takes that and cranks the volume up to 11. 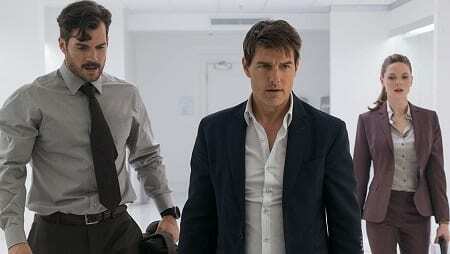 Famously delayed after a Tom Cruise stunt went awry, the series’ sixth installment seeks to make up for lost time by delivering more action than ever. Following the arrest of Solomon Lane (Sean Harris), The Syndicate has reformed itself into The Apostles, a terrorist cell that continues to wreak havoc around the globe. With word that three plutonium cores have been stolen the IMF springs into action, setting up a buy with Ethan Hunt (Cruise), Benji (Simon Pegg) and Luther (Ving Rhames) on the ground. Things go sideways, however, and the three cores end up in the wind. Their one lead is that unidentified extremist John Lark will be meeting with an arms dealer known as the White Widow (Vanessa Kirby) to purchase the plutonium. Hunt, along with CIA operative Walker (Henry Cavill), head to Paris to intercept, detain and impersonate Lark so that they can attend the meeting and take possession of the cores. Once there they encounter a familiar face, MI6 agent Ilsa Faust (Rebecca Ferguson), whose own goals seem to run in contrast to IMF. Upon finally meeting the Widow, Hunt learns the cost isn’t financial, but instead it’s an exchange: the cores for the rescue of Lane, who is being transported by police through the city the following day. With no obvious options, Hunt and his team must now break out their most dangerous foe in an attempt to recover the plutonium cores, all while other intelligence agencies remain involved to unknown ends. There are some brilliant set pieces in Fallout. The kind you go back and watch multiple times just to appreciate how well constructed they are. At the top of the list are the incredible fight in a Paris nightclub’s bathroom, and the operation to liberate Lane from police custody. There’s just such an organic intensity there, and it’s hard not to get fired up watching them. We’re not big on aping the talking points of the supplemental materials, but they’re definitely right on one thing: Fallout feels like culmination of the last several films. There’s the good will toward characters, like Benji and Luther, that only builds over time, the continued relationship between Ethan and Ilsa, and the return of Hunt’s wife, Julie (Michelle Monaghan). You also get a returning villain, new team member and quality actors Alec Baldwin and Angela Bassett playing positions of authority. Mission: Impossible has shown a deft touch when it comes to pacing as well as the blending of serious action and comic relief, and director Christopher McQuarrie handles that ably again. Every time it feels like you need a breather or a clever quip to keep things from getting too hectic or too dark that’s when you get it. The whole thing is just a lot of fun, offering enough plot to make the action meaningful and still delivering all the crazy stunts you’d expect. As Anthony Hopkins once noted in MI2, it isn’t mission difficult, it’s mission impossible. That being said, the climactic helicopter chase feels detached from reality, pulling you away from an experience that’s so carefully curated with the amount of real stunt work and hard-hitting action that brought you to that point. It’s not ruinous by any means, but maybe it’s time to stop trying to one-up everything purely on spectacle. While the absence of Jeremy Renner was reportedly due to his commitment to Avengers (which, of course, he wasn’t in), it seemed weird that they didn’t in some way address the absence of the character Brandt during the film. Hell, at least a line of dialogue to explain why a central team member is suddenly M.I.A. would’ve sufficed. Instead, we get nothing. We’re not sure how we feel about Fallout‘s extras. On the one hand, the 50-plus-minute Behind the Fallout is slickly produced and covers a lot of behind the scenes stuff, and though there are definitely repetitive talking points there’s also pretty interesting content. On the other, a deleted scenes montage is about as big of a tease as you’ll find — yes, the reason it’s done that way is explained via commentary, but it doesn’t make it any less frustrating. We want to know what IMF was doing at that facility in the snow and see more of Hunt and Ilsa together. Give us real deleted scenes! With a solid plot, strong cast and excellent action, Mission: Impossible — Fallout is the best the series has been and one of the most enjoyable films of 2018. This entry was posted on Monday, December 3rd, 2018 at 8:08 pm	and is filed under Herija Green, Movie Reviews. You can follow any responses to this entry through the RSS 2.0 feed. Both comments and pings are currently closed.